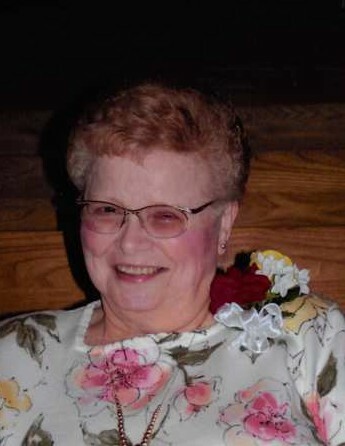 Juanita M. (Blohm) Glascock, 88, of Frankford, MO, went to be with the Lord at 7:35 p.m. Thursday, April 11, 2019, at Country View Nursing Facility in Bowling Green, MO surrounded by her family, after a long fight with end stage kidney disease and congestive heart failure. Funeral services will be held at 2:00 p.m. Thursday, April 18, 2019, at the Smith Funeral Home & Chapel. Rev Richard Epperson will officiate. Burial will be in the Grand View Burial Park. Visitation with family and friends will be held 12:00 o’clock noon until 2:00 p.m. Thursday, April 18, 2019, at the Smith Funeral Home & Chapel. Juanita was born April 5, 1931, in Hannibal, MO the daughter of Walter and Agnes (Brown) Blohm. She was united in marriage to Wilbur F. Glascock on December 11, 1949, in New London, MO and they celebrated 57 loving years of marriage before his passing on July 19, 2007. Survivors include her children, Dale Glascock of New London, MO, Kevin Glascock (Linda) of Jefferson City, MO, Lisa Fisher (Brian) of Union City, IN; ex son-in-law, Frank Schwendemann of Frankford MO; ex daughter-in-law, Carol Glascock, of St. Louis, MO; grandchildren, Clinton Hughes (Jeffrey), Amy Dameron (Joe), Keriann Sheffield (Jason), Ashlee Smith (Seth), Kori Willibrand (Aaron), and Kelsey Ocheskey (Jeff); step grandchildren, Kristen McConnell (Mat), and David Fisher (Cierra); great grandchildren, Abigail, Jacob, Trevor, Joey, Luke, Lydia, Mason, Sidney, Bailey, Hope and Everly; step great grandchildren, Mati, Hadley; sister, Marilyn Gray, of Colorado. Also surviving are numerous nieces and nephews. In addition to her parents and husband, Juanita was preceded in death by her brothers, Wesley and Nelson Blohm and a sister, Virginia Herman. Upon graduating from Ilasco High School, Juanita married Wilbur and started raising their family on a farm outside of Frankford. Juanita worked as a homemaker raising her children until the late 1960’s when she started working as a teller for Mercantile Bank in Louisiana. She always greeted customers and staff with a smile. She worked at the bank for over 25 years before her retirement in the late 1990’s. Juanita was a loving and caring wonderful mother, homemaker and worker. She loved to cook, kept an immaculate house, was highly skilled with a sewing machine and enjoyed feeding her cardinals and hummingbirds. A country girl at heart, gardening and canning was also a passion. If it was a sunny day, she would be outside tending to her flowerbeds while listening to her numerous wind chimes or refilling her hummingbird feeders. As an outstanding cook, she always had a big meal prepared on the weekends for her family. It blessed her heart that she could pass on her love of cooking to her daughter and grandchildren. She was known for baking the most delicious cinnamon rolls, variety of homemade desserts and best homemade ham noodles. Her memories will be cherished. She will be dearly missed and forever in her family’s hearts. Away from work and home, Juanita enjoyed traveling out west with Wilbur to many of the national parks especially Yellowstone National Park, and through the mountains of Colorado and Wyoming. She had a love for country music and had traveled to Nashville several times and attended the Grand Ole Opry. One thing was for certain, Juanita loved to travel but being at home always brought her great peace. Mrs. Glascock was a member of Hall Creek Club in Frankford and Salt River Christian Church in rural New London. Pallbearers will be Dale Glascock, Kevin Glascock, Frank Schwendemann, Clinton Hughes, Joe Dameron, Seth Smith and Brian Fisher. Honorary pallbearers will be Jason Sheffield, Jeffery Hughes, Aaron Willibrand and Jeff Ocheskey. Memorial contributions may be made to the Pike County Home Health and Hospice, in care of the Smith Funeral Home & Chapel.